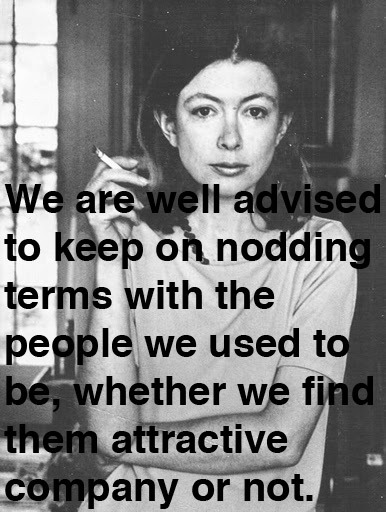 I’ve been reading some Joan Didion lately and while I adore and marvel at her writing ability, she doesn’t hold back any punches and you can sometimes feel like she has repeatedly nailed you in the kidneys. Reading her now, I can’t believe how much of it slid past me as a younger woman. I was too riddled with illusions to really ‘get’ much of her writing. I think for maybe even a decade I must have been in a foggy haze of self-sacrifice for relationships which I see clearly now was not in anyone’s best interests. To have that sense of one’s intrinsic worth which constitutes self-respect is potentially to have everything: the ability to discriminate, to love and to remain indifferent. To lack it is to be locked within oneself, paradoxically incapable of either love or indifference. If we do not respect ourselves, we are on the one hand forced to despise those who have so few resources as to consort with us, so little perception as to remain blind to our fatal weaknesses. On the other, we are peculiarly in thrall to everyone we see, curiously determined to live out — since our self-image is untenable — their false notion of us. We flatter ourselves by thinking this compulsion to please others an attractive trait: a gist for imaginative empathy, evidence of our willingness to give. Of course I will play Francesca to your Paolo, Helen Keller to anyone’s Annie Sullivan; no expectation is too misplaced, no role too ludicrous. At the mercy of those we cannot but hold in contempt, we play roles doomed to failure before they are begun, each defeat generating fresh despair at the urgency of divining and meeting the next demand made upon us. Ever avoided an email? A phone call? An ex? Alienation from self. In my case of alienation from my self, I would lie awake for hours next to the one I supposedly loved, unable to let go of the false self and simply collapse into my snoring, teeth-grinding, pillow drooling sleepy real self. I’m so thrilled to be over all of that. Though, I still have my moments, which is why I’ve put up a sizable chunk of the text from her essay in my closet in case as I get dressed I do so through someone else’s eyes. As Didion warns, if we lose our self-respect, we are in grave danger of running away to find ourselves only to find “no one at home”. Liking your ‘home’ doesn’t happen overnight but inch by sometimes white-knuckled inch you can begin to make your life really your own.